WT4 Features: -Includes tool box and wheels. -Safety stool. 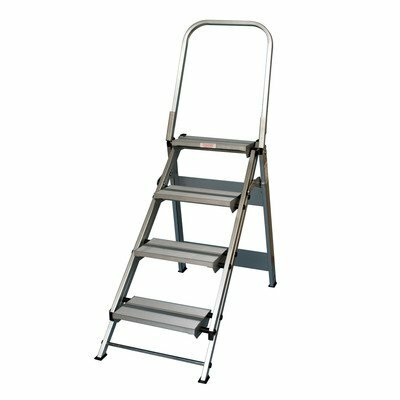 -Non-slip steps with foldable safety grab bar. -Folds away easily and stores in small spaces. -Incorporates a sturdy positive locking system. -Foldable grab bar for extra climbing stability. Product Type: -Step stool/Step ladder. Color: -Silver. Duty Rating: -Type IAA (Extra Heavy Duty) 375 lbs. Number of Steps: -4. Folding: -Yes. Lightweight: -Yes. Slip-Resistant Steps: -Yes. Dimensions: -No-slip steps with 8" deep tread. -Extension: 35.75". Overall Height - Top to Bottom: -4.67 Feet. Overall Product Weight: -26 lbs. If you have any questions about this product by Xtend & Climb, contact us by completing and submitting the form below. If you are looking for a specif part number, please include it with your message.